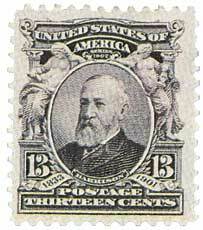 U.S. #308 was the first Series of 1902-03 stamp to go on sale. Benjamin Harrison’s family was among the First Families of Virginia, arriving in 1630. America’s 23rd President was born in North Bend, Ohio, on August 20, 1833. The second of eight children, Harrison did not grow up in a wealthy household, despite his family’s distinguished roots. His father chose, rather, to spend the farm’s income on his children’s education. Young Harrison spent much of his childhood outdoors hunting and fishing. Benjamin was seven when his grandfather, William Henry Harrison, was elected President of the United States. After attending Farmer’s College near Cincinnati and Miami University in Oxford, Harrison moved to Indianapolis, Indiana. Shortly after, Harrison was admitted to the bar and worked in the office of John H. Ray. That same year, he also worked as the Federal Court of Indiana’s crier, making court announcements in the streets. He later started his own law practice and worked as a reporter for the Indiana Supreme Court. 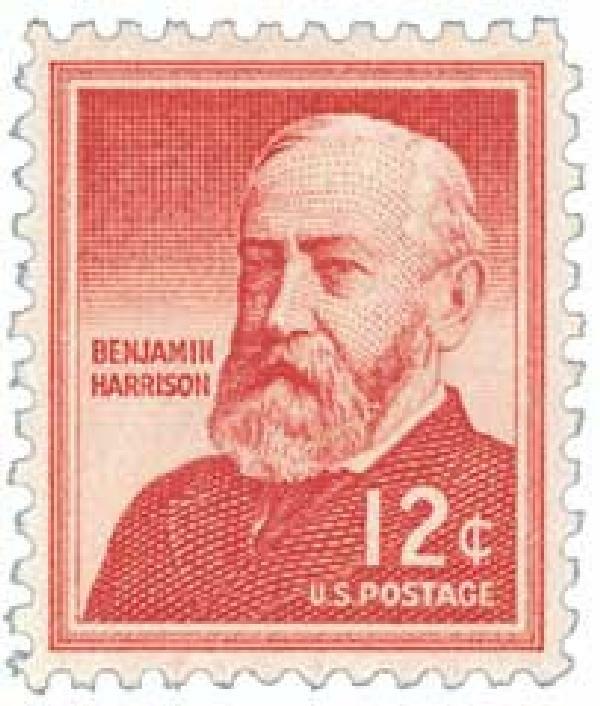 U.S. #622 – Some believe this stamp was issued to satisfy Postmaster General Harry New, whose father once worked with Harrison. When the Civil War began, Harrison wanted to join the Union Army, but worried he would not be able to financially support his family. In 1862, Harrison visited Governor Oliver Morton, who was worried about the state’s lack of soldiers. The governor asked Harrison to recruit a regiment, but not serve. Once Harrison had assembled his soldiers, Morton offered him command of the unit, but he refused because of his lack of military experience. Harrison was then commissioned a second lieutenant. He spent most of his first two years doing reconnaissance and guarding railroads in Kentucky and Tennessee. By 1864, Harrison was moved to the front lines and led a brigade at the Battles of Resaca, Cassville, New Hope Church, Lost Mountain, Kennesaw Mountain, Marietta, Peachtree Creek, and Atlanta. After the war, Harrison represented the government in a civil claim that earned him public attention. He also received high praise from his party for his numerous speeches in support of Republican candidates. In 1888, Harrison ran as the Republican nominee against incumbent Democratic President Grover Cleveland. Harrison’s campaign revolved largely around the issue of protective tariffs. In the end, Harrison received 90,000 fewer popular votes than Cleveland, but won the Electoral College 233 to 168 – thus winning the election. Harrison was inaugurated on March 4, 1889, the 100th anniversary of George Washington’s first inauguration as President, earning him the nickname “Centennial President.” One of the first issues Harrison dealt with was civil service reform. Harrison also took joy in seeing the Dependent and Disability Pension Act go into effect, a cause he had worked for while in Congress. The act provided pensions to disabled Civil War veterans and reduced the Federal budget surplus. Another significant issue that arose early in Harrison’s term was the tariff. Over time, high tariff rates had built a significant surplus in the U.S. Treasury. While Democrats wanted to lower rates, Republicans, including Harrison, sought to keep the rates high and spend the surplus on internal improvements and allow for the removal of some internal taxes. The resulting McKinley Tariff raised tariffs even higher. Harrison also passed the Sherman Antitrust Act, which bans specific business activities that reduce competition and additionally requires the Federal government to investigate trusts and companies believed to be in violation. President Harrison made several attempts at civil rights reforms, though he had little success. Among these was a bill that would “secure all our people a free exercise of the right of suffrage and every other civil right under the Constitution and laws.” Although the bill was defeated in the Senate, Harrison continued to speak publicly about the rights of African-Americans. 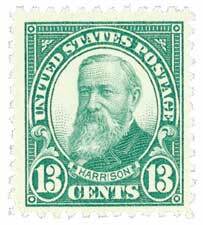 U.S. #1045 – Harrison stamp from the Liberty Series. During Harrison’s time in office, technological advances were made in countless industries across the country. Harrison was the first President to have his voice recorded and preserved. He also had electricity installed in the White House. Interestingly, he and his wife feared electrocution so they did not want to touch the light switches. As a result, they often slept with the lights on. Harrison strongly supported active foreign relations and trade. One of the first international issues Harrison faced was over fishing rights along the Alaskan coast. Canada had claimed fishing and sealing rights around the Aleutian Islands, which violated the Monroe Doctrine. After the U.S. Navy seized Canadian ships, Harrison’s administration began negotiating with the British. As a result, they reached a compromise, with the British paying the U.S. in 1898. In 1891, Harrison narrowly averted war after his minister to Chile granted asylum to Chileans seeking refuge from that nation’s civil war. Tensions increased when two American sailors were killed and 36 arrested when they attempted to take a brief shore leave there. Harrison personally drafted a letter demanding their release and an apology, which greatly infuriated the Chilean minister of foreign affairs. President Harrison nearly ended diplomatic relations, but the matter was resolved when Secretary of State James Blaine returned to Washington and made pleas for peace, ending the standoff. 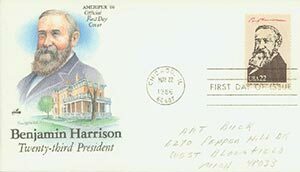 U.S. #2218e – 1986 Harrison First Day Cover. One of Harrison’s last actions as President was signing a treaty with Hawaii that would annex the island nation to the United States. Following an uprising there, the queen was removed and a new government put in place. Harrison supported annexation and wished to establish a naval base at Pearl Harbor. Although he submitted the bill to the Senate, they moved too slowly and President Cleveland rejected the treaty shortly after taking office. With the silver and tariff issues still in question, and the Panic of 1893 looming, Harrison narrowly won his renomination bid at the 1892 Republican Convention. In a rematch of the 1888 election, he faced off once again against Grover Cleveland. However, this time, many who had previously supported high tariffs now favored reform, granting Cleveland growing support. To make matters worse for Harrison, his wife died just two weeks before the election. In the end, Harrison lost the election to Cleveland by 132 electoral votes and over 380,000 popular votes. After leaving the White House, Harrison visited the World’s Columbian Exposition before returning home to Indianapolis. He spent six years on the Board of Trustees of Purdue University. The former President also attended the First Peace Conference at the Hague, taught at Stanford University, and wrote a book titled, This Country of Ours. Members of the Republican Party attempted to get him to run for President again in 1896, but he refused. Instead, he traveled the nation making speeches in support of William McKinley. 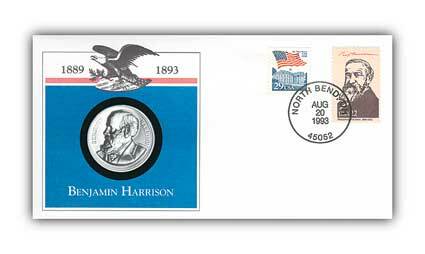 Item #97812 – Harrison stamp and platinum medal on 160th birthday commemorative cover. Perhaps one of Harrison’s most impressive post-White House feats came in 1900, when he worked as an attorney for the Republic of Venezuela in their boundary dispute with the United Kingdom. Harrison filed an 800-page brief and argued the case in Paris for more than 25 hours. Despite losing the case, it earned him international respect. In February 1901, Harrison developed a bad cold he never recovered from. President Harrison died of pneumonia on March 13, 1901. 9 Responses to "This Day in History… March 13, 1901"
Really enjoy this daily feature. A truly outstanding individual who put the greater good in all things above his personal ambitions. Correction, this is what true republicans DID. We desperately need an individual like him running for President today. 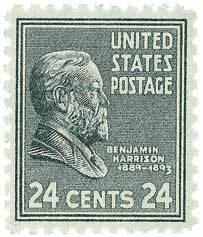 Benjamin Harrison seems to be one of those presidents whose actions and accomplishments have not been well known and I would assume that few of us know very much about him. Today ,thanks to Mystic, I have learned more about him than my total previous knowledge. A case could be made for him to have been a visionary of sorts as he was unable in his administration to accomplish various objectives but through them he laid the groundwork for future presidents to tweak his ideas and pass them as their own. Most notable among these are Cleveland, McKinley, And T. Roosevelt. And the beat goes on. Much of the history of then and those issues are prevalent today. Like how casually you mentioned that “the queen was removed” in the Kingdom of Hawaii. so why not depose the monarchy and become a part of the USA? Though constitutionally illegal , they went ahead. The consequences were pretty much of a genocide for the Hawaiian people. Great info. I learned a lot.